Eelgrass (Zostera marina L.) is an aquatic flowering plant common in tidelands and shallow waters along much of Puget Sound’s shoreline. The species is restricted to soft-sediment habitats. Sexual reproduction occurs through seed production. Vegetative spread occurs via growth of below-ground rhizomes, which can result in the formation of large, dense beds. 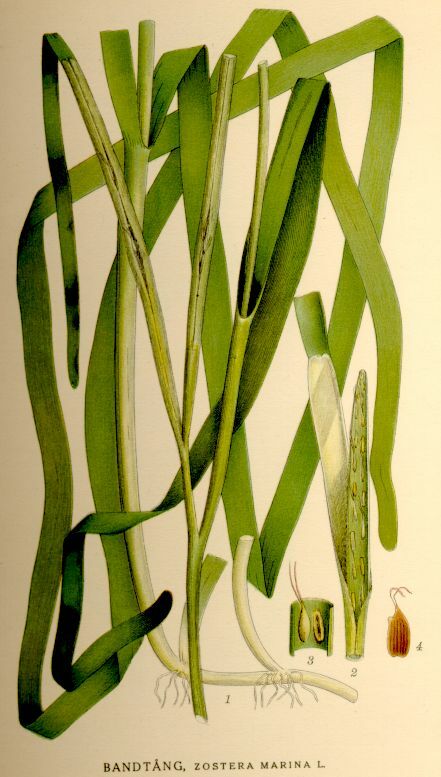 Eelgrass is widely recognized for its provision of important ecological functions (e.g., Hemminga and Duarte 2000, Duarte 2002), which in Puget Sound include the provision of energy to sustain diverse nearshore food webs (e.g., Simenstad and Wissmar 1985), as well as the creation of structurally complex habitat for a suite of species including herring, crab, shrimp, shellfish, waterfowl, and salmonids (Simenstad 1994, Heck et al. 2003, Mumford 2007). Eelgrass also stabilizes sediments and minimizes shoreline erosion (Duarte 2002). Because eelgrass requires growing conditions that include good water clarity and low nutrients, eelgrass abundance is considered to be an important indicator of estuarine health (e.g., Dennison et al. 1993, Hemminga and Duarte 2000). Industrial, agricultural and residential practices in upland areas and watersheds, and particularly activities that increase inputs of nutrients and suspended sediments, can negatively impact the growth of eelgrass. Direct physical impacts to eelgrass, such as propeller scour, overwater structures and shoreline development, also pose threats (Mumford 2007). In Washington, Z. marina has been designated a species of special concern by WDFW (WAC 220-110-250) and as critical habitat by the WDOE Shoreline Management Act (RCW 90.58). Eelgrass occurs in shallow soft sediments habitats throughout much of Puget Sound, with the notable exception of the southernmost portion (Mumford 2007, Gaeckle et al. 2009). Two habitat types are distinguishable based on nearshore geomorphology. Eelgrass flats are expansive, shallow beds typically located in bays, but also found at river deltas and shoals. Eelgrass fringe habitats consist of comparatively narrow, linear beds that follow the shoreline. In Puget Sound, eelgrass fringe habitats are more common than eelgrass flats, but because some flats are large in areal extent, the total area occupied by eelgrass is distributed roughly equally between the two habitat types. In the north Puget Sound and Saratoga-Whidbey regions, eelgrass occurs predominantly in large flats in Padilla and Samish Bays, which together account for approximately 25% of the total eelgrass in Puget Sound. By contrast, in the central, southern, and Strait of Juan de Fuca regions of Puget Sound, fringe beds are more common. Multiple factors determine eelgrass distribution, including substrate availability, water clarity, wave energy, light attenuation, water temperature, tidal amplitude, and desiccation stress (Hemminga and Duarte 2000). In Puget Sound, the maximum depth to which eelgrass grows ranges from approximately 1.3 m below the low tide line (MLLW) to greater than 9 m deep. The deepest beds are found in the Strait of Juan de Fuca and the San Juan Islands (Gaeckle et al. 2009) . The Nearshore Habitat Program of the Washington State Department of Natural Resources (WDNR) monitors eelgrass distribution and abundance through the Submerged Vegetation Monitoring Project (SVMP). The SVMP was established in 2000 to better understand eelgrass resources throughout Puget Sound and to detect temporal changes the distribution and abundance of eelgrass. The SVMP is part of the Puget Sound Assessment and Monitoring Program (PSAMP), a multi-agency effort coordinated by the Puget Sound Partnership to monitor diverse physical and biotic aspects of the Puget Sound ecosystem. Eelgrass is sampled annually at approximately 100 randomly-selected sites and 6 six permanent “core” sites (Figure 1). Sampling is performed at three spatial scales: Sound-wide, within regions, and within individual sites. Since monitoring began in 2000, more than 270 sites have been assessed. The SVMP was designed to detect changes that occur at annual and longer-term (5- and 10-year) temporal scales. The SVMP’s primary programmatic performance measure is the ability to detect a 20% decline in eelgrass abundance over 10 years at the Sound-wide scale (Berry et al. 2003, Gaeckle et al. 2009). Data collection is carried out using underwater videography recorded along transects. Twelve to fifteen transects are sampled per site, oriented perpendicular to shore and sampled using a line-intercept method. Figure 1. Distribution of site sampled in 2008 by SVMP sound -wide eelgrass monitoring study (reprinted from Gaeckle et al.2009 with permission from Nearshore Habitat Program, Washington Department of Natural Resources). Currently about 22,800 ± 4,500 hectares of eelgrass exist in greater Puget Sound, occupying approximately 43% of Puget Sound shoreline (Gaeckle et al. 2009). Eelgrass is more abundant in north Puget Sound than in the south. Approximately 91% of the estimated 9,859 ±2,603 hectares occurs in large, shallow embayments (Gaeckle et al. 2009). At individual sites, the areal extent of eelgrass ranges from less than 1 hectare to more than 3,000 hectares. Trends in eelgrass distribution and abundance in Puget Sound prior to 2000 are difficult to establish due to a lack of long-term and broad-scale information preceding the initiation of the SVMP. Thom and Hallum (1990) performed a comprehensive examination of historical hydrographic charts, aerial photographs, WDFW survey information and other limited observations of eelgrass distribution in Puget Sound. The authors reported apparent declines in eelgrass abundance since the late 1800s in Bellingham Bay and the Snohomish River Delta, and an apparent increase in eelgrass abundance over approximately the same period in Padilla Bay. Since monitoring began in 2000, the SVMP reports that the total area occupied by eelgrass in the Puget Sound has remained relatively stable (Gaeckle et al. 2009)(Figure 2). Despite this, site-level analyses suggest that in seven out of the last eight sampling periods, declines have been more frequent than increases (Gaeckle et al. 2009, Puget Sound Partnership 2009)(Table 1 and Figure 3), and sites with long-term declines outnumber sites with long-term increases (Gaeckle et al. 2009). Declines generally have occurred at smaller sites, while the extensive beds in the region, such as Padilla Bay and Samish Bay, remained stable. Gaeckle et al. (2009) conclude that the SVMP data suggests an overall pattern of slight declines in eelgrass throughout Puget Sound. Table 1. Results of a multiple parameter assessment of regional Z. marina condition based on data collected from 2000-2008. The number of measurable changes within a region was quantified and compared to the number of significant positive or negative changes (alpha = 0.05). From Gaeckle et al. 2009, Nearshore Habitat Program, Washington Department of Natural Resources. The relative importance of the factors driving fluctuations in the distribution and abundance of eelgrass in Puget Sound is not well understood. Changes in key abiotic factors such as water clarity and nutrient levels may be important, yet analyses linking such abiotic data to eelgrass abundances have not been conducted. Consequently, the causes for declines in eelgrass cover documented by the SVMP are not known, nor are the ecological consequences of such declines for the taxa that utilize eelgrass habitat such as birds, invertebrates and fishes. Eelgrass is critically important for maintaining nearshore ecosystem function and is recognized as a valuable indicator of ecosystem health. While the overall aerial extent of eelgrass in Puget Sound has shown no significant change over the past eight years, sharp local declines have been reported at some sites. The causes of these declines have not been established. Berry, H. D., A. T. Sewell, S. Wyllie-Echeverria, B. R. Reeves, T. F. Mumford, J. R. Skalski, R. C. Zimmerman, and J. Archer. 2003. Puget Sound Submerged Vegetation Monitoring Project: 2000-2002 Monitoring Report, Nearshore Habitat Program. Washington State Department of Resources, Olympia, WA. Dennison, W. C., R. J. Orth, K. A. Moore, J. C. Stevenson, V. Carter, S. Kollar, P. W. Bergstrom, and R. A. Batiuk. 1993. Assessing water quality with submersed aquatic vegetation. BioScience 43:86-94. Duarte, C. M. 2002. The future of seagrass meadows. Environmental Conservation 29:192-206. Gaeckle, J. L., P.Dowty, H. Berry, and L. Ferrier. 2009. Puget Sound Submerged Vegetation Monitoring Project: 2008 Monitoring Report, Nearshore Habitat Program. Washington State Department of Natural Resources, Olympia, WA. Heck, K. L., Jr., G. Hays, and R. J. Orth. 2003. Critical evaluation of the nursery role hypothesis for seagrass meadows. Marine Ecology Progress Series 253:123-136. Hemminga, M. A., and C. M. Duarte. 2000. Seagrass Ecology. Cambridge University Press, Cambridge, UK; New York, NY. Mumford, T. F. 2007. Kelp and eelgrass in Puget Sound. Seattle, WA. Puget Sound Partnership. 2009. Ecosystem Status & Trends. Puget Sound Partnership. Simenstad, C. 1994. Faunal associations and ecological interactions in seagrass communities of the Pacific Northwest coast. United States Environmental Protection Agency, Seattle, WA. Simenstad, C. A., and R. C. Wissmar. 1985. Delta carbon-13 evidence of the origins and fates of organic carbon in estuarine and nearshore food webs. Marine Ecology Progress Series 22:141-152.